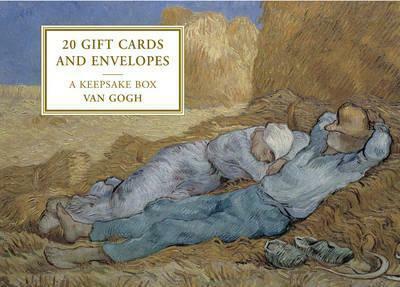 This is a beautiful collection of 20 cards and envelopes depicting 10 paintings by Van Gogh contained within a keepsake tin box. The name of each painting is given on the back of the card. The inside of each card is left blank so that it can be used for any occasion. The card images feature 10 of the best-loved artworks by the master of Impressionism, Vincent Van Gogh. The featured paintings are "Cafe Terrace at Night", "The Afternoon Nap", "Self-portrait with Fur Hat", "Church of Auvers-sur-Oise", "Portrait of Dr Gachet", Van Gogh's "Bedroom at Arles", "Twelve Sunflowers in a Vase", "Irises", "Cornfield with Cypresses", and "Vincent's Chair with Pipe".